"Prickly heat also called: miliaria, sweat rash and heat rash is a harmless type of skin rash. This rash occurs when the ducts connecting sweat glands with the surface of the skin get blocked & perspiration gets trapped under the skin. Prickly heat is usually seen when the climate is warm and the weather is humid such as during the summer. It can also appear in other climates if a person is overdressed. People who are on bed rest & infants can also develop sweat rash with 15% of newborns getting the skin condition. Miliaria is a benign condition and it's usually only the itching which causes discomfort. There might be some mild skin peeling (called desquamation). In most cases, heat rash disappears on its own in a few days. Treatment is mainly directed towards the itching caused by it. Miliaria can be controlled by keeping the skin cool and dry and avoiding intense activity which causes excessive perspiration." Prickly heat rash appears on the skin when a person is in a hot or humid environment. Baby's are susceptible to prickly heat as their sweat glands are not as well developed. Obese individuals and those who sweat profusely are also more likely to get miliaria. The condition occurs when the sweat ducts get blocked. 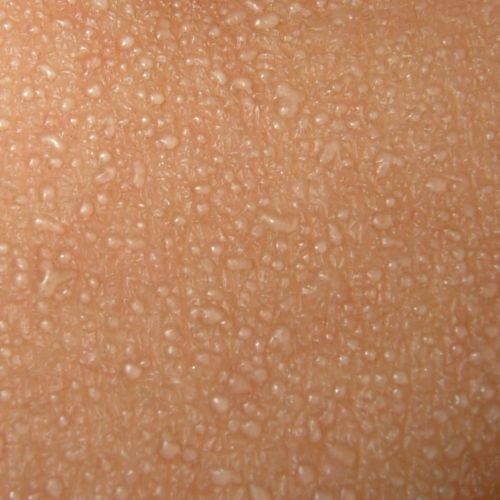 The sweat which gets trapped causes inflammation, itching and tiny red bumps on the skin. The exact cause of this obstruction is not known. It is believed that the bacteria Staphylococcus epidermidis may play a role. A sticky substance secreted by these bacteria along with dead skin cells may obstruct the sweat ducts causing this disease. Babies and adults are susceptible to prickly heat. Prickly heat occurs on any part of the body, however, it is usually seen in areas covered by clothes and those areas associated with increased sweating. This rash appears as tiny spots, bumps or blisters. The blisters are usually associated with intense itching and a pins and needle sensation which can be uncomfortable. The affected area appears red due to inflammation. There are various types of prickly heat that are classified based on the level of obstruction of the sweat ducts and any associated bacterial infection. Miliaria crystallina or miliaria sudamina is a mild form of this condition. The obstructed ducts of the sweat glands occur close to the surface of the skin. The affected person develops multiple tiny blisters that look more like pearls of sweat. There may be mild itching or no itching at all. The condition clears on its own in a few hours or days. No treatment is necessary. 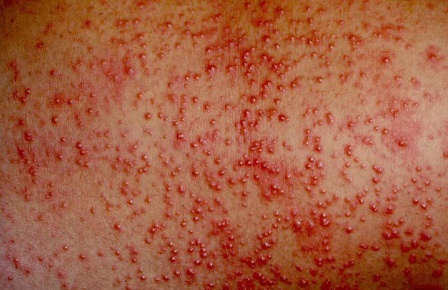 Miliaria rubra is the most common form of this condition and is referred to as heat rash or prickly heat. The obstruction leads to seepage of sweat into the surrounding tissue which causes inflammation. This leads to larger blister like rashes that are reddish. It is associated with symptoms like itching, pins and needles and lack of sweating in the affected part. If miliaria rubra affects a larger part of the body then a mild fever may develop. The condition usually forms in places where there are skin folds or where two skin areas touch The condition frequently flares up during the day and subsides at night. Prickly heat rash images like this one shows a case where the rash has spread all over the body and manifested as small red bumps. The patient reported being very itchy. If left untreated the prickly heat rash can become more widespread and severe, even persisting all night. Over time the rash can become more fixed and inflammatory. If the person is experiencing excessive perspiration the pimples or papules can become capped by a fluid-filled sac called a vesicle. Miliaria rubra can cause discomfort. Video showcasing pictures of prickly heat rash on body. Miliaria profunda, is the most severe form of heat rash but is uncommon. In this form, there is complete obstruction of the sweat ducts in the deeper layer of skin, the dermis. 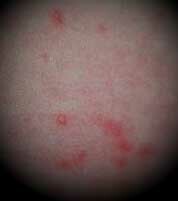 This occurs in individuals who develop recurrent episodes of miliaria rubra. The condition is commonly seen on the arms, legs, and trunk. Itch is not associated with this form of prickly heat. Bigger flesh colored lumps develop on the skin. Itching is not common. But with this type of heat rash, there is an increased risk of developing fever and heat exhaustion as the body cannot dissipate heat through sweat. Miliaria pustulosa occurs when the disease is associated with bacterial infection, due to continual scratching. Miliaria Profunda can be debilitating and is the cause of a condition called hypohidrosis syndrome or anhidrotic asthenia, which can be fatal. Prickly heat and skin papules coming and going. Treatment involve resting in a cool place. Recovery is quick, however full recovery in terms of being able to sweat normally can take weeks to months. 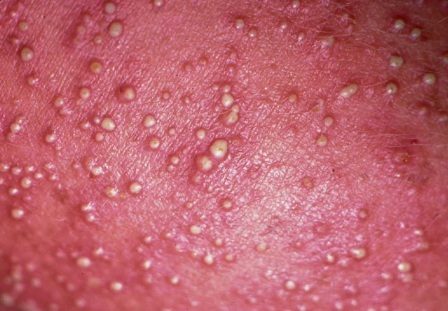 Miliaria pustulosa occurs when a bacterial infection take hold in the skin. This form of miliaria is caused by constant scratching. It is always preceded by some type of sweat bland blocking or injury. The condition is usually found on areas where two skin areas rub together such as under the breasts or arms. It also occurs on the scrotum and flexible surfaces on the arms and legs. Dr Adam Friedman, MD describes the symptoms and easy solutions to get rid of prickly heat. Home remedies and prevention tips. Common forms of this condition are harmless and will disappear on its own. Affected persons have intense itching and most often the treatment given is to relieve itching. Keeping the skin cool and dry prevents the development of this disease. One should consult a doctor if there is an infection, if the rash persists for a long period of time and if it is associated with fever. Applying calamine lotion to the affected area keeping the skin cool and decreasing the amount of sweating. If you get the very itchy and red form of miliaria, then try a benzoyl peroxide body wash since bacteria may be for blame (might be labeled for acne). Menthol also has similar properties in keeping the skin cool. Antiseptic soaps can be used which will reduce the number of bacteria on the skin which are believed to play a role in the development of prickly heat. Moisturizing creams containing lanolin can be applied to the skin which prevents blockage of sweat ducts. Once the condition has developed, steroids creams can be applied which will reduce the inflammation. Antibiotics may be needed if there is an infection. Avoiding heat and humidity, an air conditioner or a fan can be used to avoid heat and humidity. Keeping the skin cool and dry by staying in an air-conditioned room and taking showers many times a day can keep the skin cool and dry. After showers, the skin should be allowed to air dry instead of toweling off. Prickly heat powder and antiperspirants can also keep the skin cool and dry. Wearing loose cotton clothes can reduce the incidence of miliaria, Silk, nylon and polyester clothing should be avoided. Avoid creams and ointments as these can block the openings of the sweat ducts. If you require something to help with a skin condition, consider a homeopathic product such as Skin Dr. which contains ingredients known to support the skin (see site for research). To prevent prickly heat rash or lesions avoid overheating. Remove any excess clothing, say in an air-conditioned environment and take cooling paths.